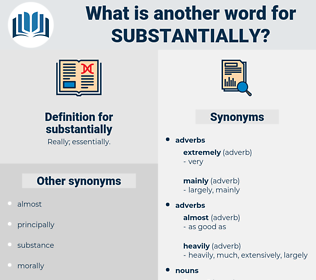 What is another word for substantially? 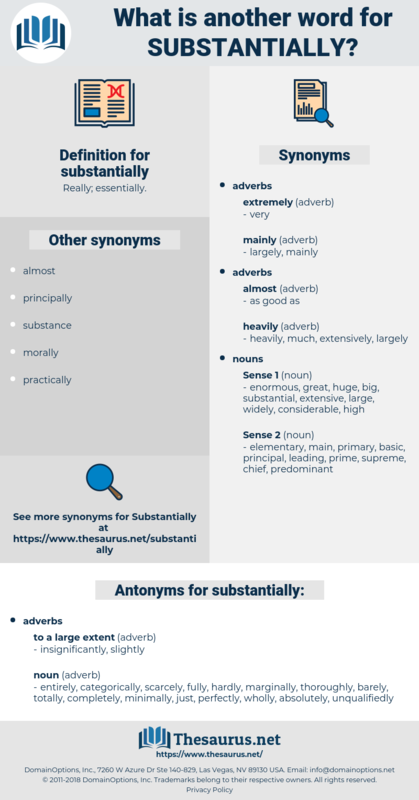 markedly, greatly, noticeably, drastically, appreciably, vastly, significantly, dramatically, considerably. basically, fundamentally, largely, much, heavily, enormously, tremendously, radically, widely, severely, tangibly, extensively, perceptibly, remarkably, quite, meaningfully, seriously, strongly, clearly, notably, massively, broadly, measurably, immensely, mostly, immeasurably, steeply, roughly, crucially, vigorously, principally, actually, nearly, fairly, very, profoundly, intrinsically, conspicuously, generally, thoroughly, slightly, visibly, grossly, consistently, hugely, importantly, concretely, somewhat, effectively, inherently, well, deeply, extremely, chiefly, decisively, strikingly, really, amply, definitely, obviously, overwhelmingly, approximately, relatively, comprehensively, decidedly, exponentially, notoriously, reasonably, substantive, substance, infinitely, marginally, generously, critically, rather, vitally, disproportionately, sensitive, steadily, robustly, completely, important, plainly, manifestly, actively, ultimately, globally, energetically, vehemently, sensibly, hardly, sufficiently, gravely, starkly, great, totally, plenty, firmly, truly, badly, earnestly, genuinely, incomparably, strong, ostensibly, frequently, fully, large, absolutely, sensitively, particularly, properly, gradually, intensively, tightly. Substantively, sharply, materially, far, distinctly. entirely, categorically, scarcely, fully, hardly, marginally, thoroughly, barely, totally, completely, minimally, just, perfectly, wholly, absolutely, unqualifiedly. I believe the woman to be substantially innocent, and I think she has almost certainly told my wife the truth, as far as she knows it. She wished the offensive operations to be practically simultaneous, and substantially achieved the object.